In chronicling the adventurous life of the legendary CIA operative and pioneer of modern counterinsurgency doctrine Edward Lansdale, The Road Not Taken reframes our understanding of the Vietnam War. The Road Not Taken is both a biography of Edward Lansdale (1908–1987) and a history of how Lansdale pioneered a “hearts and mind” approach, first in the Philippines, and then in Vietnam. It was a visionary policy that was ultimately crushed by America’s military bureaucracy, steered by elitist generals and blue-blood diplomats who favored troop build-ups and napalm bombs over winning the trust of the people. 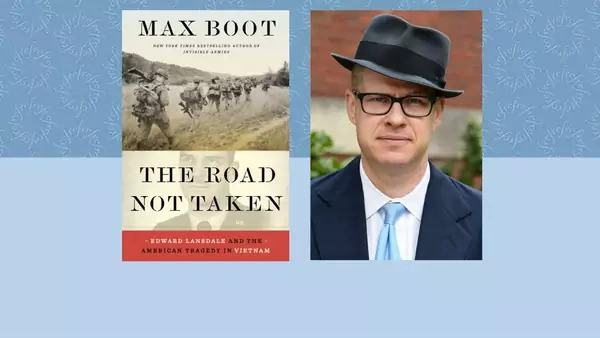 Through dozens of interviews and access to never before-seen documents—including long-hidden love letters—Max Boot details the successes and failures of Lansdale’s approach to counterinsurgency and its relevance for current conflicts. He traces the rise and fall of the roguish “T.E. Lawrence of Asia,” from the battle of Dien Bien Phu to the humiliating evacuation in 1975. This biography sheds light on the course of the Vietnam War, a conflict whose legacy still haunts American foreign policy, and on vital issues such as how the United States can effectively fight insurgencies abroad, how it can deal with autocratic allies, and how it can most effectively dispense military and political advice to foreign partners of dubious reliability. In this cautionary American story, Max Boot explains that U.S. troops on the ground only served to hinder the development of legitimate, democratic South Vietnamese institutions that Lansdale argued could have gained the people’s trust. That so few leaders have adopted Lansdale’s “hearts and minds” strategy is a testament to its difficulty, yet could prove effective in dealing with U.S. involvements in Afghanistan and Iraq today. Why did the United States fail to support independence for Indochina after WWII? Did Cold War considerations contribute to the Truman administration’s neglect of Vietnamese desires for sovereignty after WWII? Lansdale believed that by removing South Vietnamese President Ngo Dinh Diem from power in 1963, the “Americanization” of the war became inevitable. Are there ways in which the “Americanization” of the war could have been avoided, even with the assassination of Ngo Dinh Diem? What was the typical mindset that “afflicted many American representatives in their dealings with Asians” (p. 261) and how did it shape American policy in Vietnam during this time? How did American leaders’ assumptions about communism lead to pursuing ineffective policies in Vietnam and in places with other forms of governments? In what ways was the January 1968 Tet Offensive a significant benchmark in the Johnson administration’s approach to Vietnam? Write an 850-word opinion piece on American policy toward nation-building based on lessons learned from the history of American involvement in the Philippines and Vietnam. What was Edward Lansdale’s approach to Vietnam? What difficulties did he encounter in trying to implement his strategy? What were the important events that affected the course of U.S. involvement in Vietnam? Can the United States achieve stability and security in Afghanistan? Is it possible for U.S. counterinsurgency to both diminish al-Qaeda’s hold and establish democracy in Afghanistan? Thomas L. Ahearn, Jr., CIA and the House of Ngo: Covert Action in South Vietnam, 1954-63 (Washington, DC: CIA History Staff, 2000). Christopher Goscha, Vietnam: A New History (New York: Basic Books, 2016). Stanley Karnow, In Our Image: America’s Empire in the Philippines (New York: Random House, 1989). Edward Geary Lansdale, Edward Geary Lansdale Papers (Palo Alto, CA: Hoover Institution, Stanford University). Lien-Hang T. Nguyen, Hanoi’s War: An International History of the War for Peace in Vietnam (Chapel Hill: University of North Carolina Press, 2012). Rufus Phillips, Why Vietnam Matters: An Eyewitness Account of Lessons Not Learned (Annapolis, MD: Naval Institute Press, 2008). Neil Sheehan, A Bright Shining Lie: John Paul Vann and America in Vietnam (New York: Random House, 1988).